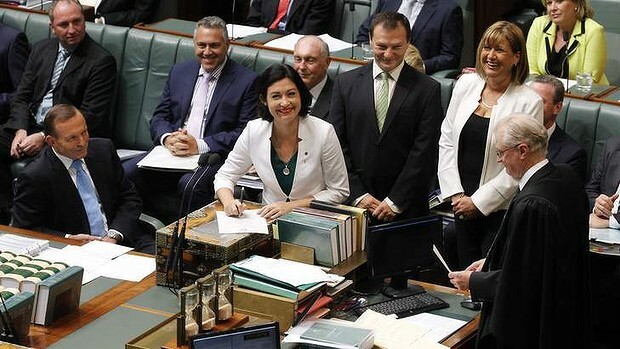 Following a hard fought by-election campaign, dominated by claims and counter claims about a Medicare Co-payment, Terri Butler was elected Member for Griffith on February 8, 2014. While her Liberal National Party opponent Dr Bill Glasson (thereafter nicknamed, ‘$6Bill’) seemed to initially support the co-payment, he backed away from that position during the course of the campaign, and senior government members, including Julie Bishop and the Prime Minister vehemently denied a co-payment was being considered. Just three months later, on Wednesday May 15, Treasurer, Joe Hockey confirmed what Ms Butler had been warning her constituents of, that there will be a Medicare Co-payment, and everyone will pay. On May 21 I recorded an interview with Terri Butler in which she reflected on that election campaign and talks about her new life as a local member. We met at the Avid Reader café in the West End, the venue for her first press conference after being preselected as Labor’s Griffith candidate in December 2013. Below is an edited transcript. Have the concerns of people in Griffith changed over the past three months since your election? Well we’ve just had a federal budget. I think that has been the single event that has crystallised for people the eventual trajectory that this government is on, and the approach that this government is taking, and the values that the Liberal National Party really have. A lot of things have happened of course in three months but I believe that has been the event that for me has drawn into sharp focus the choice of people have when they go to vote. You probably remember during the Griffith by-election there was a lot of talk about the GP tax. We were very concerned about it and the government was attempting to neutralise it as an issue by saying that they had no plans to introduce one, but of course, they were just weasel words…Well people now know that it is going to be imposed. If you look at the budget papers it will affect everybody. So the people who are already paying the $70 … will get five dollars less than they are getting at the moment. So everybody’s GP fees are going to go up because of the GP tax. I get letters, I get emails, and I get phone calls: we do street stalls at shopping centres on the weekend, and people come and talk to me about what’s on their mind. I’ve had disability support pensioners talking to me about how they are going to be affected by the budget. Pensioners are concerned about it and write to me about the GP tax. People write to me about deregulation of university fees. There is frustration out there about the complete absence of any discussion about climate change in the budget. I think you probably know that is something I find quite concerning. It seemed to me that your maiden speech was something of a rallying call for Labor to return to traditions of compassion and courage. Was it, and if so, what do you think Labor needs to do differently? We have shown that Australia can be an outward looking, engaged country. We don’t have to be scared and inward looking, and mean-spirited. A lot of labour voters are disappointed with Labor, particularly around asylum seeker policy. Was Labor being populist rather than courageous in the way it approached those policies? I have certainly read the Amnesty Report in relation to Manus Island, and read the recommendations of the Houston review [Expert Panel on Asylum Seekers]. From my own position, I want to engage in meaningful discussion about what can change, because I don’t want people living in a situation like the one at Manus, and I certainly don’t want people’s faith in our nation’s capacity to investigate the death of Resa Berati to be eroded because of this government’s failure to be transparent. In the Griffith by-election we had independent candidates calling for a new style of collaborative, grass-roots policy development. Is it possible in our current system to have more informed and nuanced policy discussions on important and complex social questions such as climate change, health funding, and asylum seekers? The independents in the by-election all stood for different things. The broader question about how you engage is a really difficult one. I think when it comes down to it, it’s actually more about…engaging in conversations. Small group conversations are obviously best. The question is the practicality of that in an electorate of 140,000 people…97,000 voters… that’s a lot of people to engage with. I have spoken briefly to Cathy McGowan, the Member for Indi. I read in The Westender that there was a session being held about the Voice for Indi campaign, and I said to her, ‘do you mind if I head along?’ and she said well it’s actually in Indi, so it might be a bit far. I’m very interested in the Victorian Women’s Trust model that she uses to engage with people, and that’s something that we will be investigating… Part of it is just giving people an avenue. In some ways the best discussions are organic, rather than set up by politicians. So its stalls, going to events, surveys, providing different opportunities for feedback, and small group meetings. It’s a range of different ways to connect with people. There has been a recent mobilisation of people through the Marches in March and May, blockades against coal mining and CSG, and on Friday there will be a national day of action against the deregulation of university fees. From what you are hearing, are these just the grumblings of a radical few, or do these actions have resonance in the electorate more broadly? Everyone’s concerned, but everyone’s expressing their concerns in different ways. It feels to me like that period in the late 1990’s and early 2000’s when people were prepared to protest…We had only been allow to march in Queensland for a decade at that point, so people were doing it, there was a lot of expression of sentiment through protests and peaceful marches…Now perhaps we’re seeing people who are doing it for the first time, finding this as one of the ways to express the fear that they have. I think when you have as much fear in the community as you do right now, that people are going to react to that. Some people do it by writing to politicians, other people will do it by arranging a demonstration and listening to speakers. I think what I noticed about the weekend’s events, was that people were very respectful of the speakers, and speakers were very diverse… it wasn’t just a bunch of kids who were bored, it was a genuine expression of dissent from our community, and that doesn’t happen often. The question is what the effect is, what’s the benefit of having a discussion. The people who need to take notice, is everyone. These events raise awareness. Everyone who participated would have gone back to their home and spoken to someone that they know, about what was said there. Politicians will attend. I was there; Senator Claire Moore was there; Jackie Trad attended: not so much to do anything other than just to listen and to hear what people’s views are. I don’t expect you will see any Liberal politicians at any marches anytime soon. I think that these things raise awareness, and they raise people’s preparedness to actually say, “This isn’t good enough”. Can you describe a typical day in a sitting week? We get to the House about 7:40. We then look at what’s coming up for the day, deal with correspondence and emails… Throughout the day there is a range of events we have to attend. Often constituents and community organisations have arranged meeting times in Canberra. There are meetings of full Caucus, and there are meetings of Caucus committees. I am on the Education Caucus Committee and the Economics Caucus Committee. Then there is generally events, for example during budget week there was an event on how the budget affect women…I intended to attend but I was in another meeting at the time. Then there is Parliamentary committee business: I am on two parliamentary committees; Social Policy and Legal Affairs, and Tax and Revenue. They meet during sitting weeks… for about two hours. And then you have training and briefings. … Then on top of that you might have press engagements; so last week that’s why I didn’t get to the women’s briefing, because we were doing a press conference in the courtyard about the ship building industry: I have a ship yard in my electorate. Then there is being in the chamber; there is a bills program or a business program each day, so you’ll be in the chamber at different times during the day. It’s just impossible to be in the chamber at all times because if you do that you’re not discharging your other obligations in respect of committee business and constituent work. And then of course there is speech writing, so a lot of the week is spent preparing notes on important topics during that week. You have given a number of speeches in Parliament. How does that work? You put your hand up. For bills I put up my hand. There’s an opportunity to give a 1.5 minute statement before question time, its first in, first served. Then you will be asked to speak. It depends on what’s going on in a day. We sit until 9:30 at night on a normal day, and you don’t leave the building during that time. I find myself running constantly; I think I’m going to keep my weight off. It’s really important to take the opportunity to speak. I imagine you are ambitious to get into Shadow Cabinet at some point. What I’m ambitious for is to represent the electorate well. I’ve got a strong view that parliamentarians should work as hard as they possibly can to represent the interests of the electorate because it is a privilege to be in the Parliament, and it’s not one that you should squander. I follow you on social media and you are out at events in the Griffith electorate every weekend and on some days you attend multiple events. Is there a personal cost to always being available, and is it sustainable? It’s interesting, before I went into the Parliament, I was running a practice group in a national law firm. Being a partner in a law firm is not a 9-to-5 job, so I’m used to the long hours, and I enjoy work. I wouldn’t have this sort of demand on my time if I didn’t want to make a contribution. Every working parent has a juggle: people in paid work, people in unpaid work, it’s just part of life, and we all are trying to manage, but yes it does bring into sharp focus for me, some of the policy settings that need to change to allow people of parenting age to fully participate in our workforce. ABC 612’s Steve Austin recently spoke with you about the dubious honour of being the 100th opposition member suspended from Parliament. How many times have you been kicked out of Parliament now? Five. Unfortunately where I sit is right at ear level for the Speaker. So I don’t really do anything particularly. But it’s actually incredibly frustrating to sit in that chamber and have Greg Hunt walk to the dispatch box and say nothing at all about tackling climate change. Nothing at all. …All he has said in question time is that we should repeal the carbon tax; that’s his whole contribution. So if you’re someone who like me believes that we need to continue to improve our policies to combat climate change it is virtually impossible not to say so. Similarly when Christopher Pyne stands up and speaks to the Parliament about nursing education in Tasmania when his LNP colleagues in Brisbane have axed nursing jobs, including at the Princess Alexandra Hospital in my electorate, it is impossible not to speak out. I make no apology for being a vocal local representative.